Who doesn’t want to play a God manipulating the fates of humankind against another God? 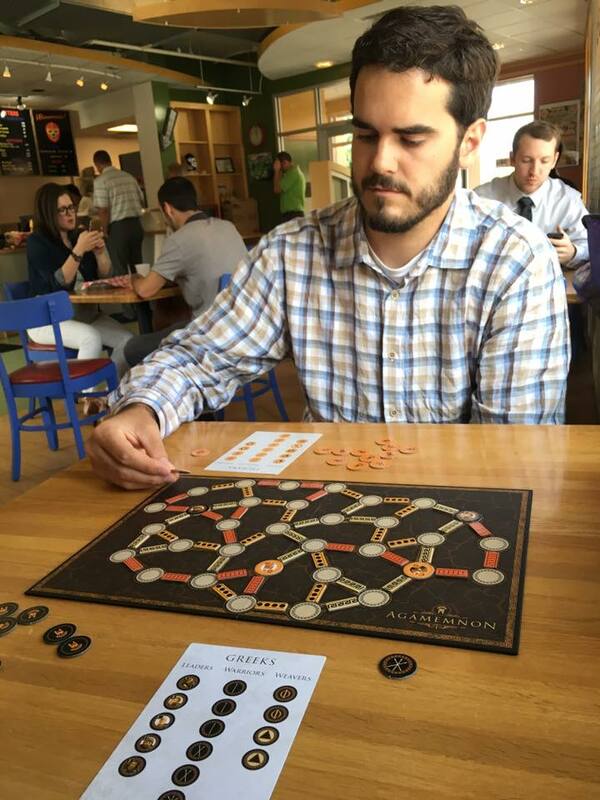 While that level of thematic immersion requires an extraordinary leap of hubris, I have a few friends I might describe as God-like in their grasp of board game strategies and their ability to grind opponents into meeple dust. 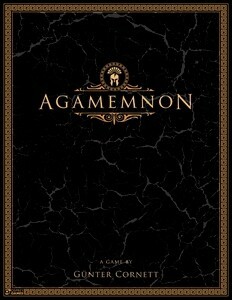 Powers of winning aside, I would prescribe Osprey’s Agamemnon to anyone wanting to embark on a strategically challenging, yet easy-to-learn game that will have you matching (or nearly so) wits and wiles against your most Mensa-infected opponents. 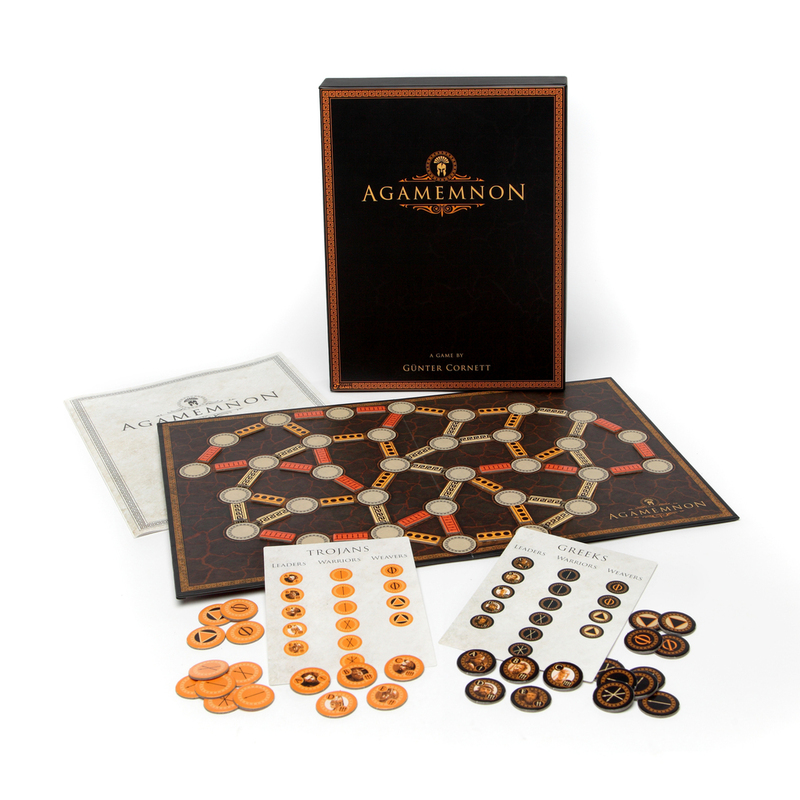 More specifically, Agamemnon, designed by Gunter Cornett and published by Osprey Games, is a two-player, abstract game for board gamers who would enjoy puzzling out control over as many multiple areas of a game board as possible. In Agamemnon, these areas are expressed as “Strings of Fate” and represent the machinations and controlling influences of the Gods during the events of the Iliad. Classic literature aficionados should note that one player is representing the mortal armies of Troy and the other, Greece. Agamemnon, who angered the gods with his hubris. Agamemnon, who led the war against Troy. 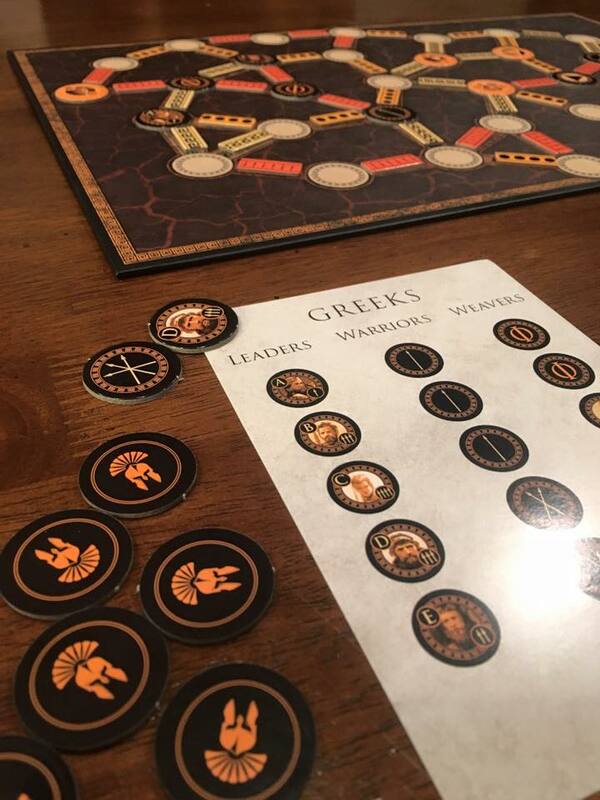 Players take turns in Agamemnon by randomly selecting and then placing two tokens (from a pool of 15 each) on a web-like game board in order to assert influence, and ultimately control, over three types of “strings.” The strings include, Strength, Leadership and Force. Different tokens are used to control different types of strings. For example, Warrior tokens are pictured with 1-3 spears and contribute toward the control of Strength Strings. Leadership tokens are also pictured with spears, but include a rank, contributing not only to Strength Strings, but also Leadership, with “A” being the highest rank. The Force Strings are controlled by the sheer number of tokens, regardless of type. In the end, the player with the most influence along each length of a given string receives all of that String’s tokens as victory points. In the case of a tie, no one benefits. As the game board is a patchwork web of “strings,” your placement of tokens often confers benefits to multiple strings simultaneously. A strategically positioned leadership token may lend its rank to a Leadership String, while also lending its arrow icons to a Strength String. This fact alone lends itself to a nearly inexhaustible number of strategies, especially when considering that your tokens are face down and two are selected randomly each turn. Each player must do the best he can with what the fates have given him. Working on control of multiple strings with a single token is one thing, but players can really shake things up with their Warp and Weft tokens. Warp tokens give you the power to drive a wedge through the middle of a string, requiring it to be treated as two strings, instead of one. A player who knows he’s going to lose an entire string can take some of the string away from the opposing player immediately or with careful planning! On the other hand, Weft tokens allow a player to pick up and switch two strings that are connected to the location where the Weft token is placed. This is a powerful move that can change the very nature of the struggle for one or more strings! Agamemnon is a terrific “thinky” game that can be played in 30 to 40 minutes, which frankly is the sweet spot for a sometimes mentally taxing game such as this. I’ve played several rounds over lunches with friends, so office workers should definitely consider this offering to accompany their bologna sandwiches. And if you happen to spill on the game board, there’s another side that will remain free of ketchup and represents an alternative, random setup option (called “The Loom”) for the string tokens, making every game even more varied. Finally, players can opt to tinker with some interesting optional rules, such as keeping all the token face up or keeping the tokens face down, but in piles separated by type. The game pieces are constructed of sturdy cardboard material, and the string tiles — even though long and thin (don’t let their look fool you) — are strong enough to withstand plucking them up by the ends and not accidentally bending them. The game also comes with a handy player aid so you can keep track of all the different tokens at your disposal. Finally, the game comes packaged in what is becoming an Osprey Games mainstay, a classy side-hinged box with just the right amount of storage and space to protect your purchase. 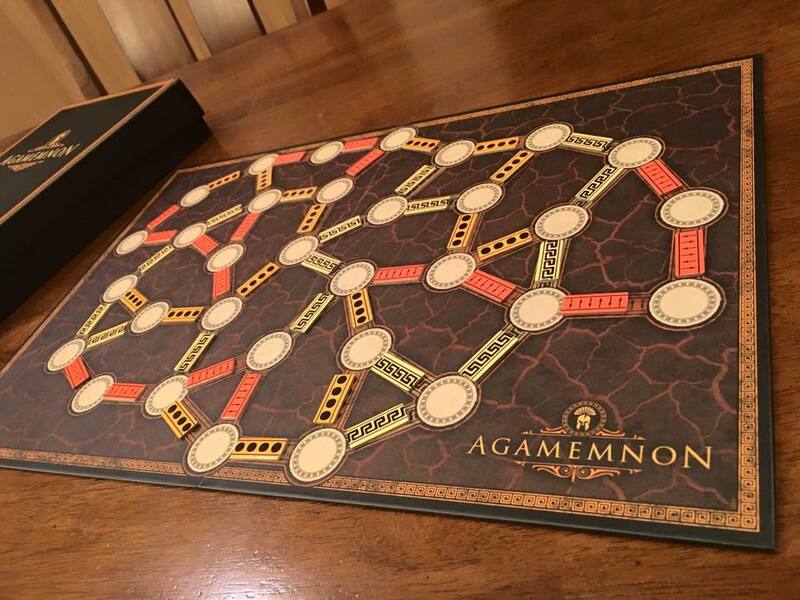 While I have yet to win a game of Agamemnon, there’s no question I have a desire to continue to play it due to its incredible depth, strategy and casual fun factor. Plus, I can teach someone to play in under 10 minutes. Our victory point totals have been within just a few points, which always makes for a satisfying experience. Close games also mean there’s not only hope for improving, but a clear indication that Agamemnon is well balanced. At the very least I can continue to assert that while I may not be a God, I occasionally play one on game night. Agamemnon is also discussed on our podcast episode, Racoon in the Wheel Well. Read other reviews of great Osprey Games titles, such as Escape from Colditz, They Come Unseen, The King is Dead and Escape from the Aliens in Outer Space! You’re welcome! I also reviewed the game within a recent podcast. I believe it was in last week’s.